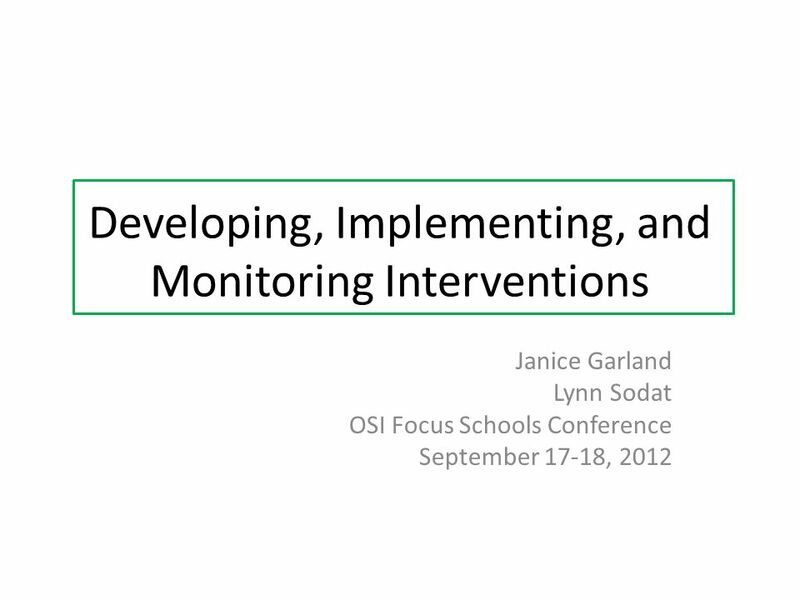 Developing, Implementing, and Monitoring Interventions Janice Garland Lynn Sodat OSI Focus Schools Conference September 17-18, 2012. 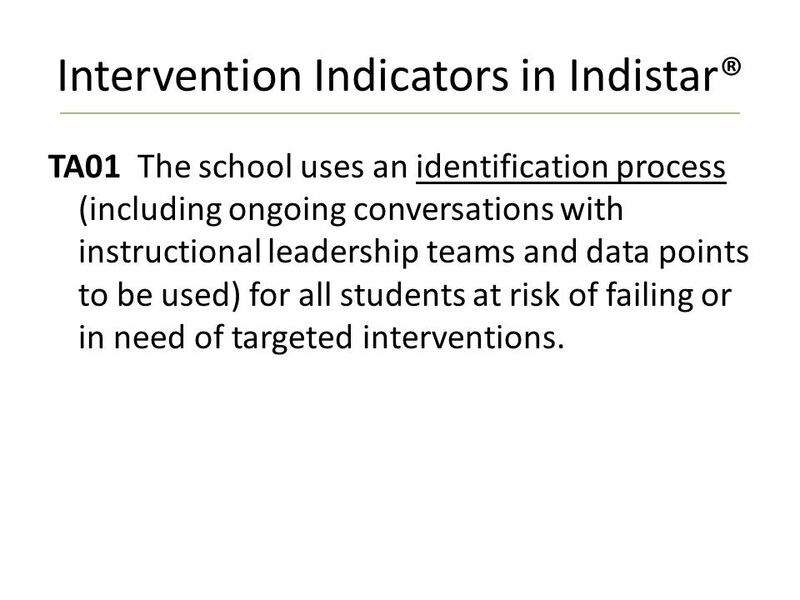 6 Intervention Indicators in Indistar® TA01 The school uses an identification process (including ongoing conversations with instructional leadership teams and data points to be used) for all students at risk of failing or in need of targeted interventions. 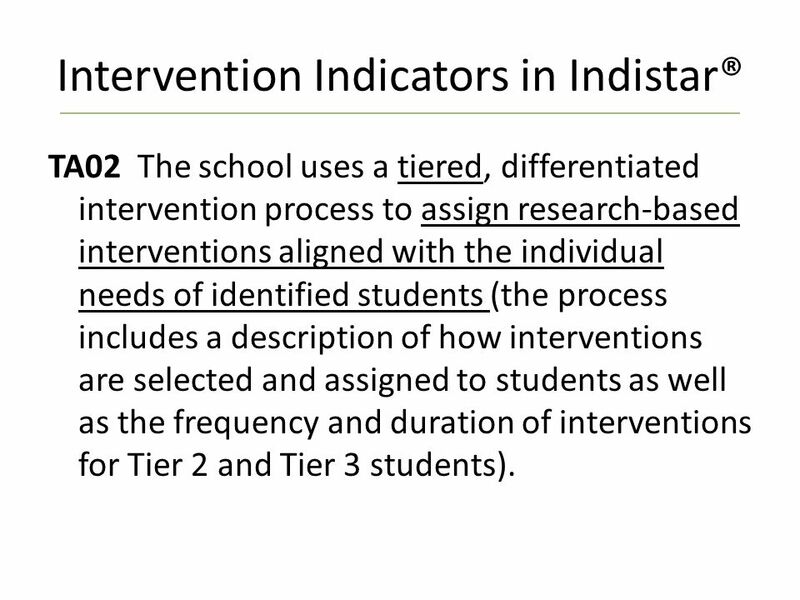 7 Intervention Indicators in Indistar® TA02 The school uses a tiered, differentiated intervention process to assign research-based interventions aligned with the individual needs of identified students (the process includes a description of how interventions are selected and assigned to students as well as the frequency and duration of interventions for Tier 2 and Tier 3 students). 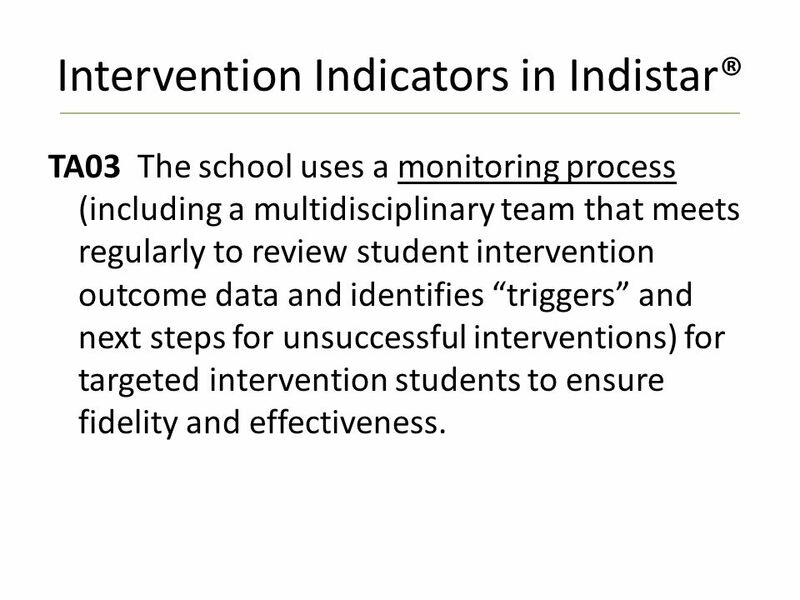 8 Intervention Indicators in Indistar® TA03 The school uses a monitoring process (including a multidisciplinary team that meets regularly to review student intervention outcome data and identifies “triggers” and next steps for unsuccessful interventions) for targeted intervention students to ensure fidelity and effectiveness. 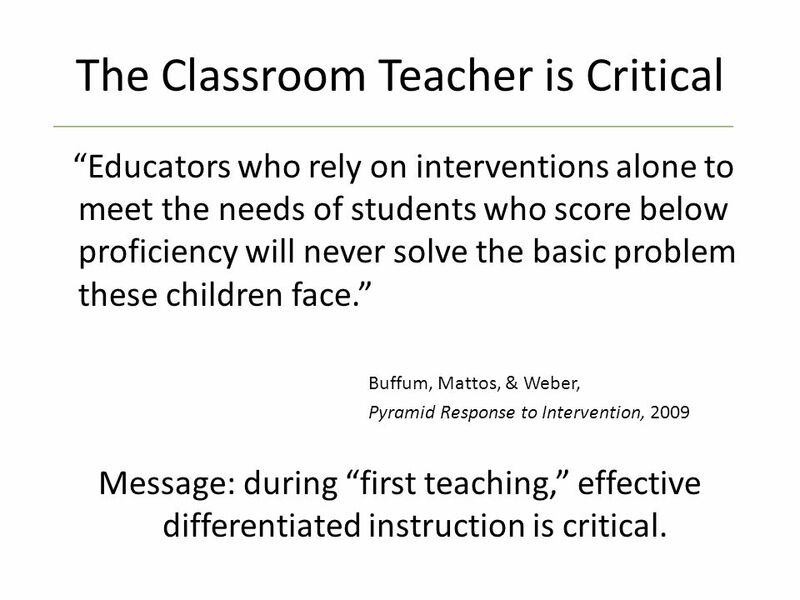 10 The Classroom Teacher is Critical “Educators who rely on interventions alone to meet the needs of students who score below proficiency will never solve the basic problem these children face.” Buffum, Mattos, & Weber, Pyramid Response to Intervention, 2009 Message: during “first teaching,” effective differentiated instruction is critical. 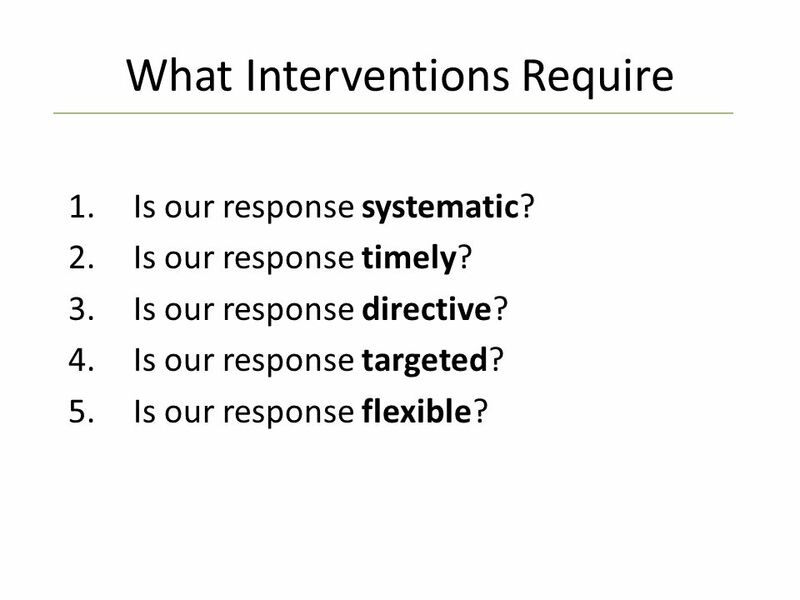 15 What Interventions Require 1.Is our response systematic? 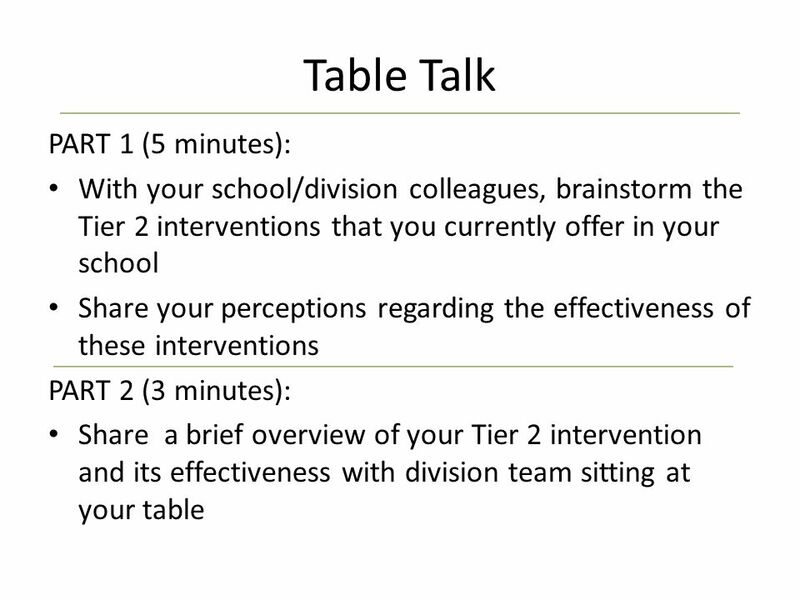 2.Is our response timely? 3.Is our response directive? 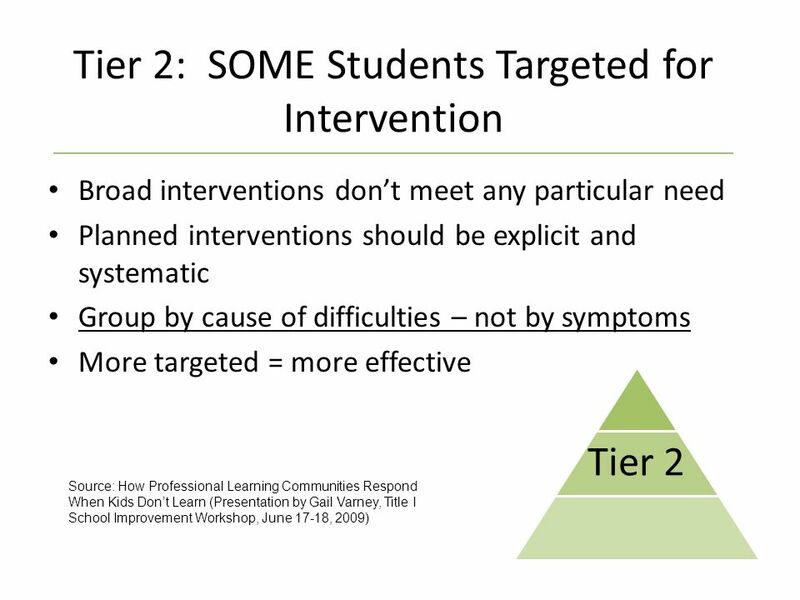 4.Is our response targeted? 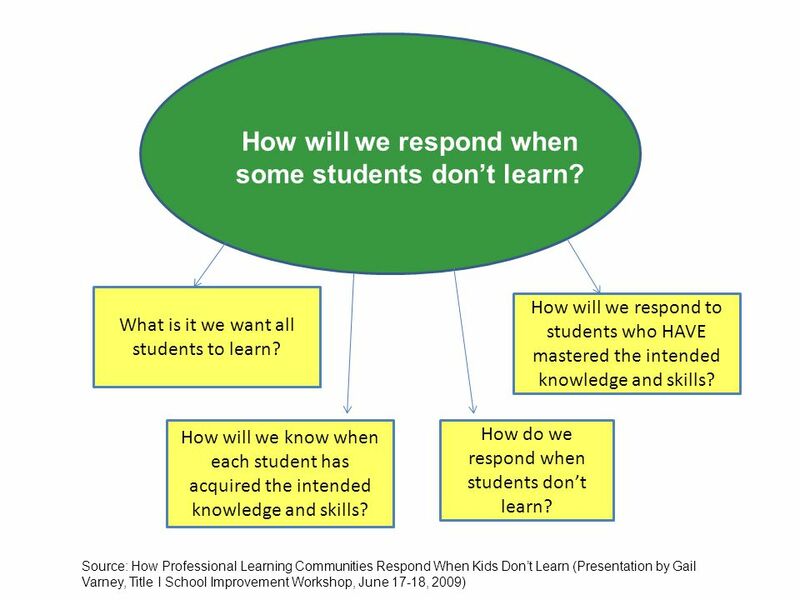 5.Is our response flexible? 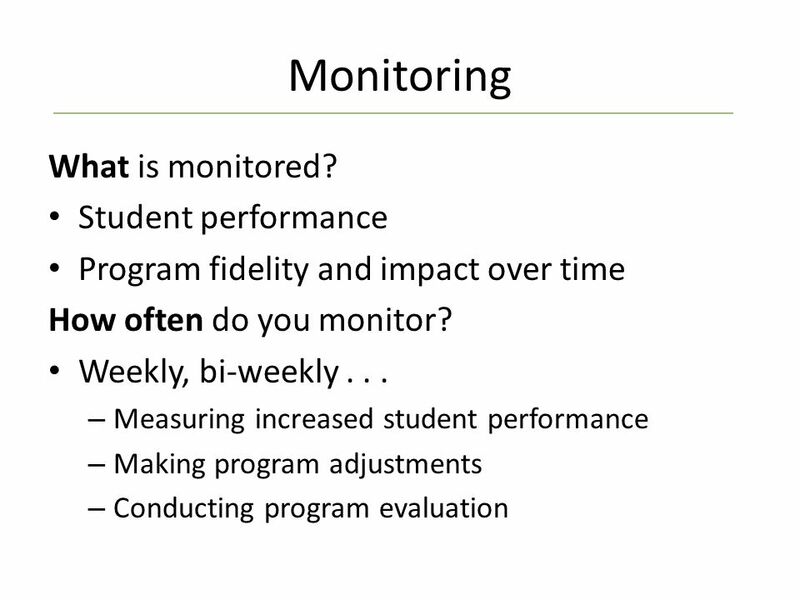 Download ppt "Developing, Implementing, and Monitoring Interventions Janice Garland Lynn Sodat OSI Focus Schools Conference September 17-18, 2012." The Role of the Literacy Coach In a Primary School: A Collaborative Model International Reading Association Annual Conference Atlanta, 2008 Presenters. 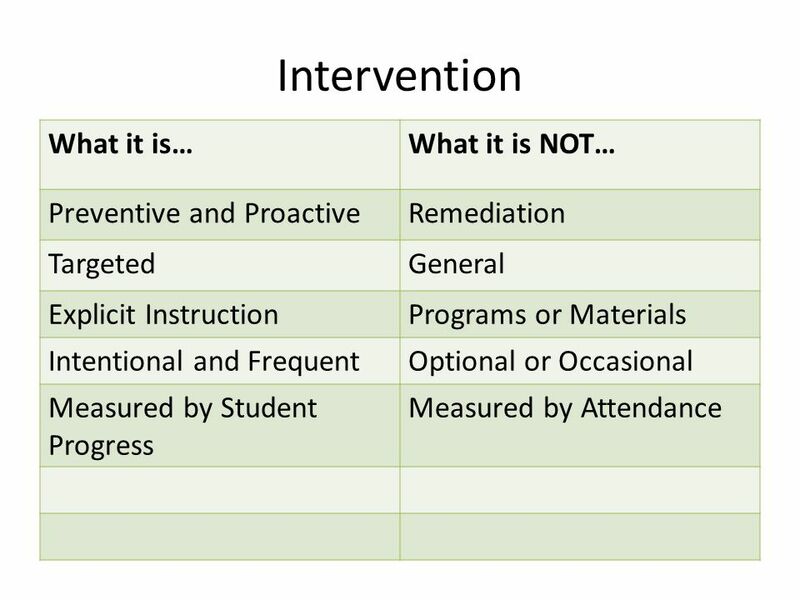 RTI: Questions and Answers June, Response to Intervention (RTI) What is it? 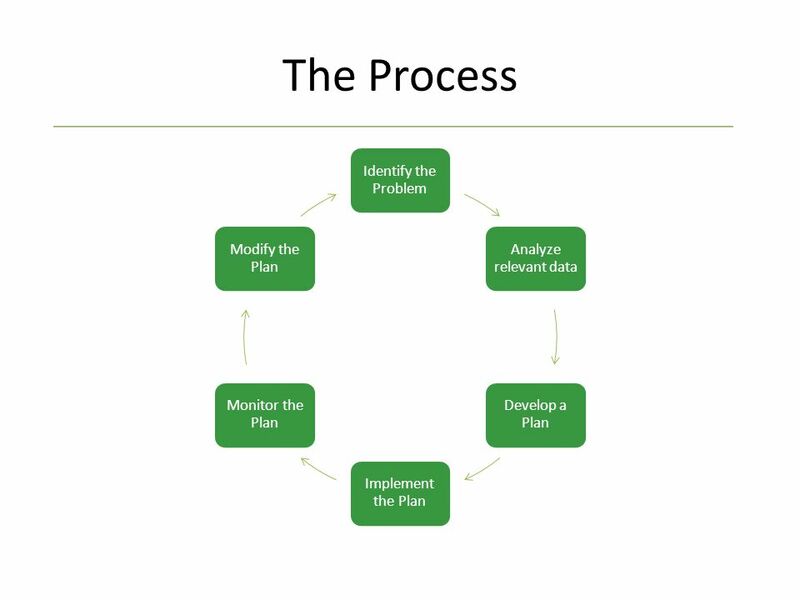 a problem-solving systema problem-solving system a way to monitor progressa. 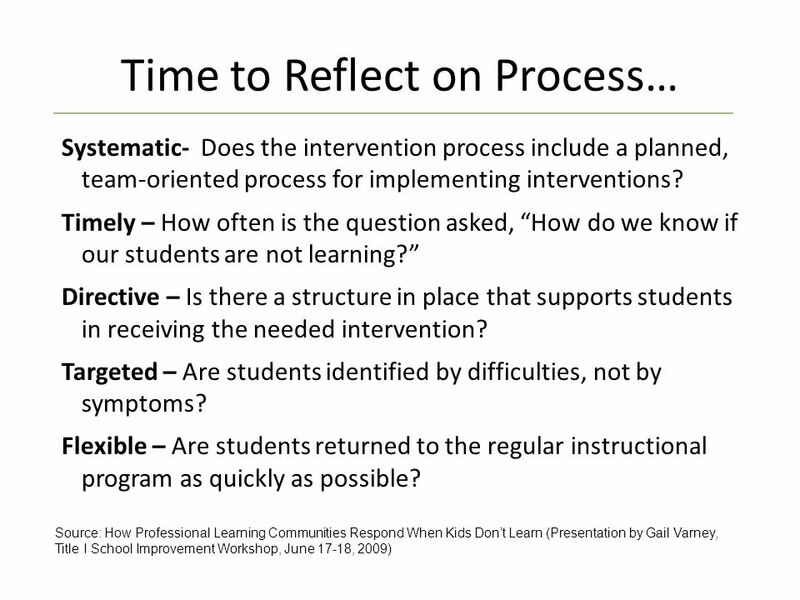 Everything You Always Wanted to Know about Problem Solving and Response to Intervention… Dont be Afraid to Ask! Laura Boynton Hauerwas, Ph.D. Ina S. Woolman. 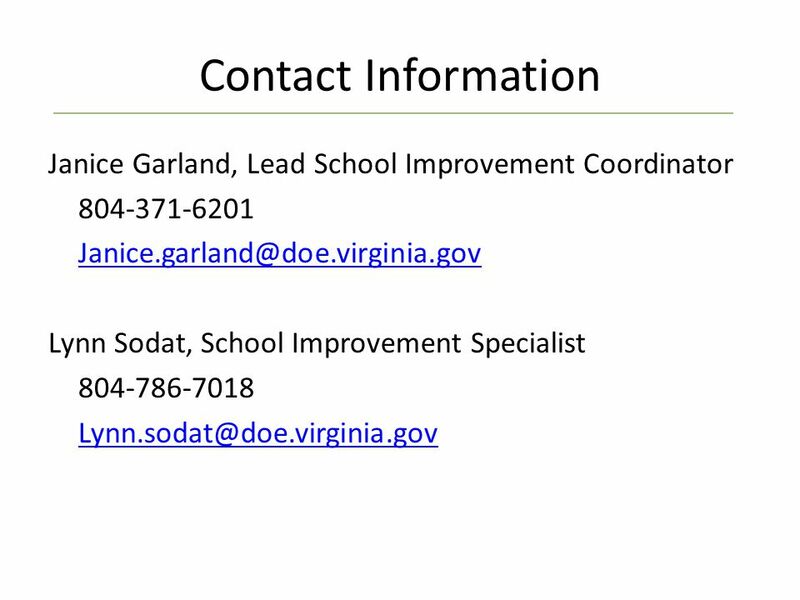 Gail Varney Title I School Improvement Coordinator How Professional Learning Communities Respond When Kids Dont Learn Title I School Improvement Workshop. 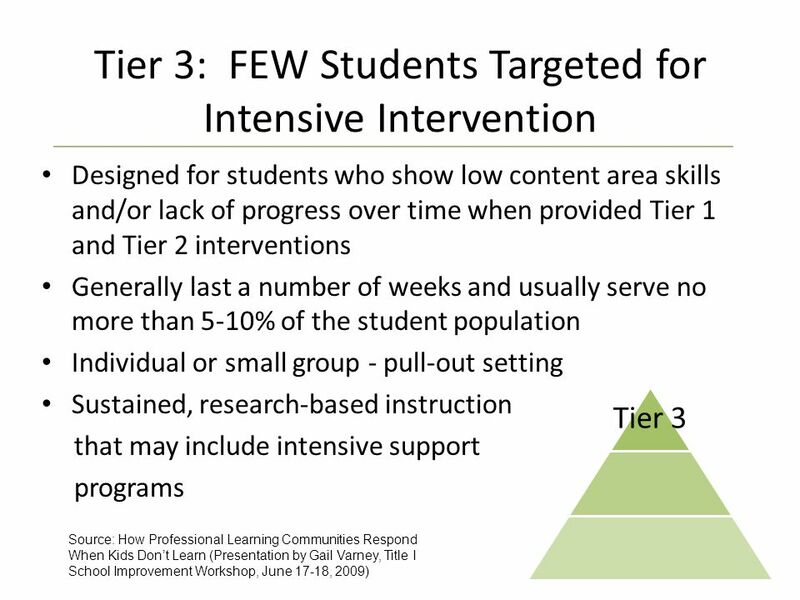 RESPONSE TO INTERVENTION _______District Presentation ______, 2008. 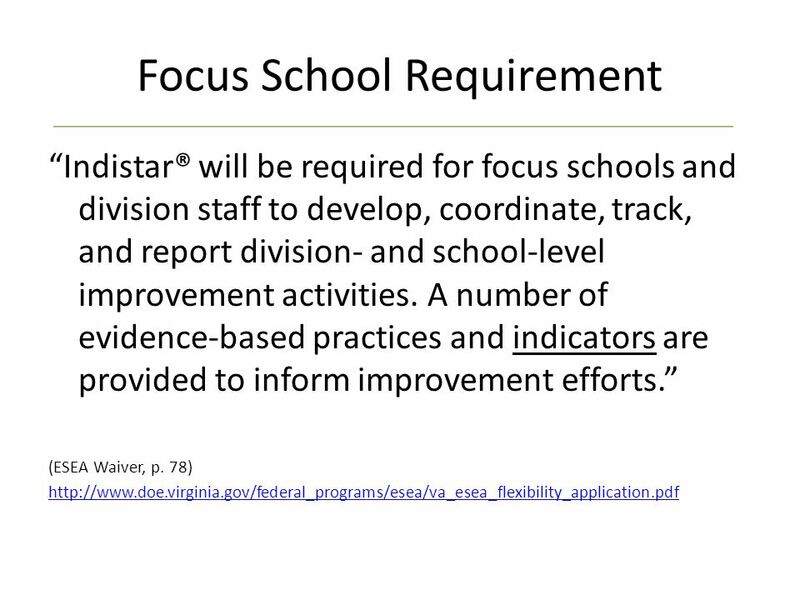 Building Leadership Team October Agenda Big Picture Formative Overview PLC Overview SMART Goal and Action Plan Plan. 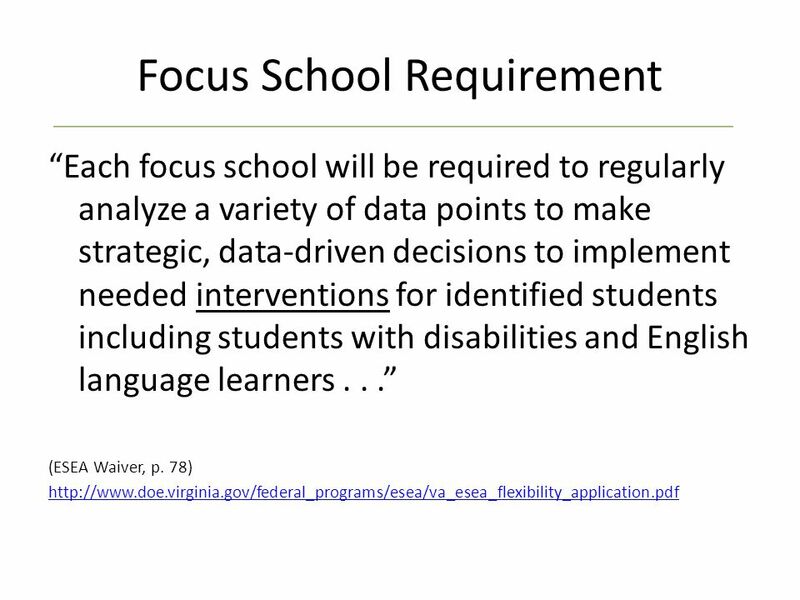 WORKING TOGETHER TO HELP CHILDREN SUCCEED. 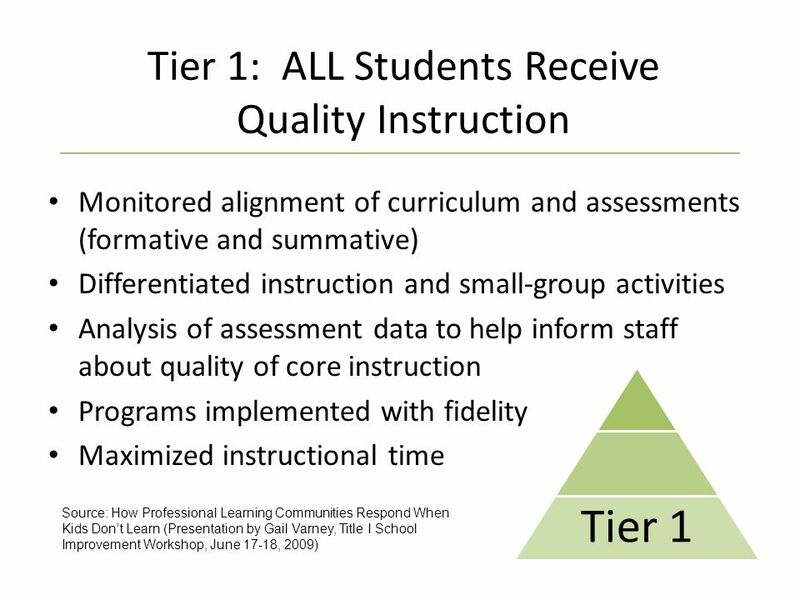 *providing high-quality instruction/intervention matched to individual student needs *systematically assessing. 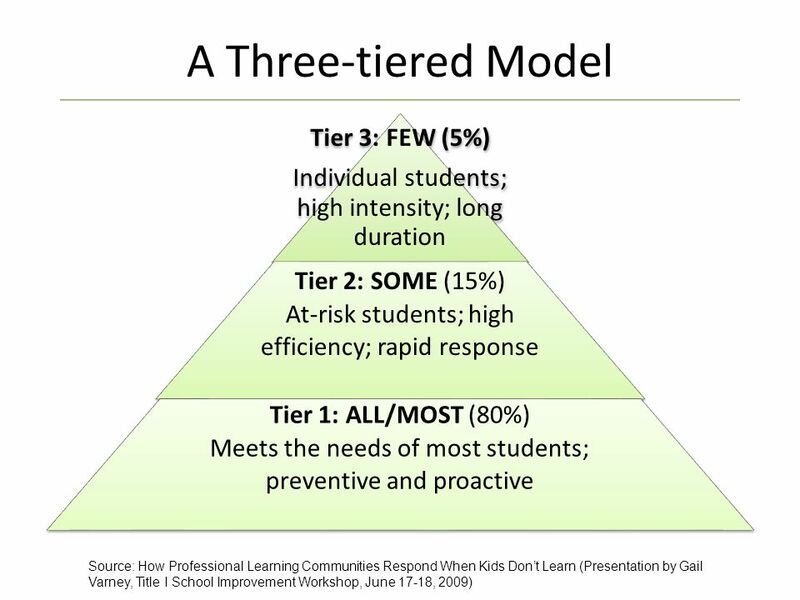 MTSS Trainers: Janet Stephenson Melissa Long School Psychologist: Griselle Zeno. Pleasant Valley Parent Information Night. 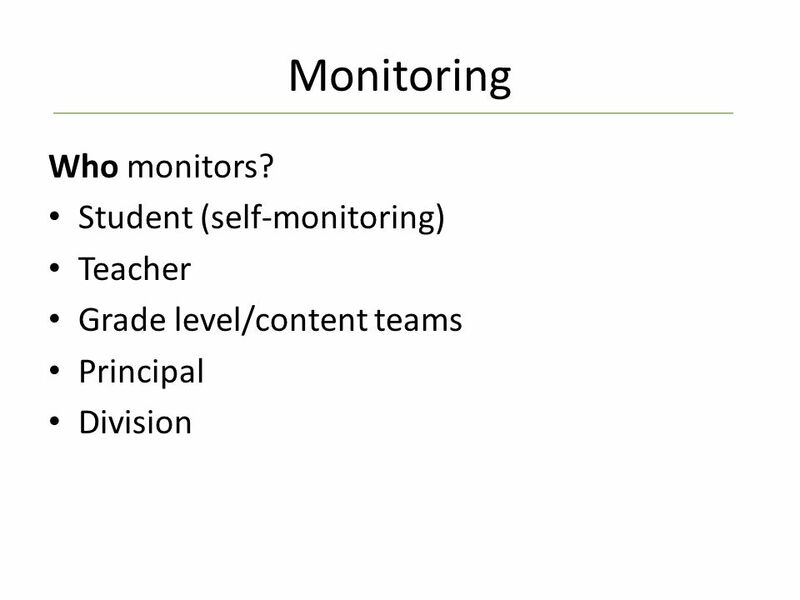 Connecticut Summit Message: We Have A Reading Problem In Connecticut Many entering K students do not have expected.